We hope this website enhances your enjoyment of our local wildflowers, grasses, shrubs, and trees. Learning their names brings a sense of familiarity that will develop as you continue to visit the Wenatchee Foothills and watch the progression of plants through the seasons. We hope that your growing appreciation of these plants will encourage you to preserve them for future generations. Resist the impulse to pick these beautiful wildflowers! 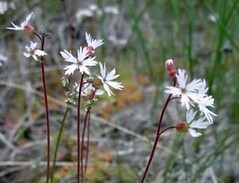 Picking a wildflower prevents the next hiker from enjoying the same beauty. It also reduces the plant’s chance for survival, impacting the insects and animals that rely on it for food and shelter. Why not leave them for everyone to enjoy? Interested in growing native plants in your garden? Visit one of our local nurseries for plants or seeds. Flower: Does not reproduce from seeds, but from bulbs in the ground that multiply by sending new bulbs out laterally, or from bulbils (fleshy, detachable buds that are pear-shaped and approximately 1 cm long) that are produced in the flowers. These fall to the ground, root, and grow. Ecology: Growing in large patches across the landscape, and drying out early like cheatgrass. 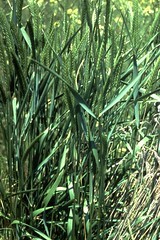 Often first invading species on shallow soils that are moist only during the winter and early spring. Drought tolerant. Bulbils are high in starch and fat so they are attractive to rodents and birds. Weed control: Invasive species that reduces diversity and other organisms that depend on diversity. Invasive, but not aggressive, it can be eradicated by establishing a competitive perennial grass. This small lily grows from a bulb and has one to several white flowers with petals, sepals and stamens in multiples of three. The hairy-edged petals look like a cat’s ear with a purple “eyebrow” at its base. The erect stem is four to twenty inches tall, with a flat leaf four to eight inches long and three quarter inch wide coming from the base. Seeds: Prolific seed producer that outcompetes native grass seedlings. Can produce in excess of 300 seeds per plant that remain viable for 2 to 5 years. Sharp-tipped seeds that collect in your clothes. Roots: Fine fibrous root system. Roots grow faster and deeper than bluebunch wheatgrass at lower temperatures, giving it a competitive edge, especially in disturbed areas. 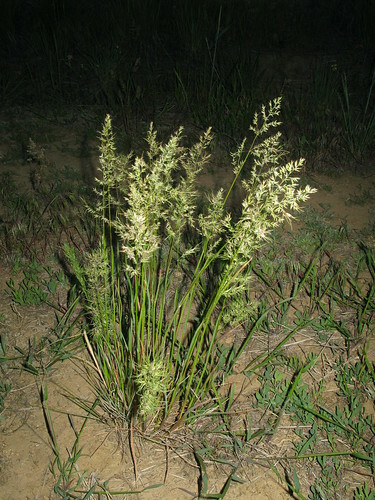 Ecology: Very common plant in the shrub-steppe region. Valuable for forage. Provides some of the earliest green feed available to deer on some winter ranges. 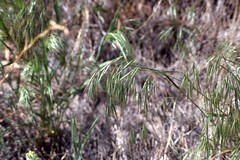 Although cheatgrass seed may be safe from most wildfires, the standing plant material provides a greater danger for increased incidence of wildfires in the landscape, shortening the fire cycle. Wherever native plants are removed, cheatgrass often takes over. This invasive species simplifies the environment and acts against the diversity of the plant community, which is not good for insect and wildlife diversity. Weed control: Fire, mowing, grazing, tillage, and inter-seeding of competitive native plants. Herbicides. Biological control is limited. This robust plant grows one to two feet tall greenish-golden stems from its taproot. Long leaves, up to sixteen inches, grow mostly at the base, but smaller ones appear on the stem. The leaves are thick and tough, minimizing water evaporation. The large flowering heads at the ends of the stems have the look of a tiny pineapple with a fringe of yellow tufts on a flat top. This member of the Sunflower family lacks “petals”, having only dense clusters of slender tubular flowers. These flower heads remain intact through the winter. Puccoon is common in the shrub-steppe, and is easily identified by a cluster of multiple long, leafy stems, eight inches to two feet tall, springing up from a woody tap root. 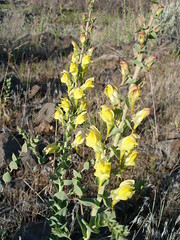 The small, pale yellow-to greenish-white flowers of puccoon appear in late spring, partially hidden among the numerous leaves near the stem tip. 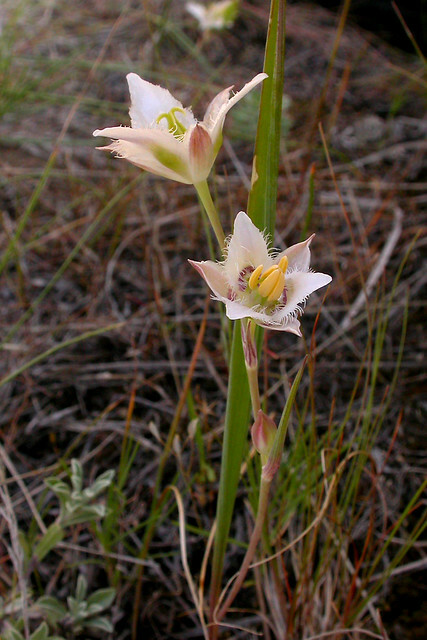 The petals are fused at the base into a narrow tube with five spreading lobes that resemble a star. 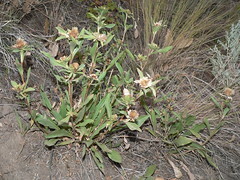 Stems are yellow-green and hairy, with narrow leaves, one to four inches long, all along the length. Each flower produces four cone-shaped, hard, bony seeds, or nutlets, only one of which matures into a shiny smooth white nutlet. Native Americans used the seeds as decorative beads. The roots were a source of a red dye. 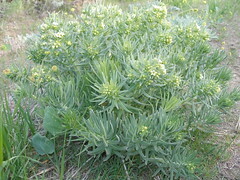 The plant was also used as a poultice to help calm itching hemorrhoids. Seedhead: Very distinct flattened seedhead measuring 1½ to 3 inches in length and tapering toward the tip. The most distinguishing feature is that the spikelets (holding the seeds) greatly overlap, and are crowded together one up against the next. Stems: Leafy, slender, and erect. Leaves: Leaves are abundant, both at the base and along the stems. Leaves are 6 to 10 inches long, about 1/4 inch wide, flat, and slightly hairy on the upper surface. Ecology: Extreme cold and drought tolerant. Good for wildlife; able to withstand heavy grazing. Benefits: Good for erosion control. Weed suppressive, especially with cheatgrass. Diffuse knapweed grows from long taproots into a bush up to two feet tall with a single upright stem sprouting many branches. 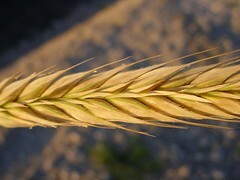 The stems have fine, short hairs, giving the plant a gray appearance. The leaves are small, alternately arranged, and finely divided. White or pale lavender flowers at the tips of the branches resemble bachelor buttons. Diffuse knapweed reproduces entirely by seeds. A single plant can produce up to 18,000 wind-dispersed seeds. These seeds are tightly held in the flower head, but are dislodged and dispersed over large distances when the plant stem breaks off later in the season and the plant becomes a tumbleweed. Diffuse knapweed is an excellent source of nectar for bees and other insects in mid to late summer when other sources are scarce. However, this virtue is far outweighed by the plant’s ecological damage. Diffuse knapweed, like other knapweeds, is thought to release allelochemicals into the ground around it, preventing the growth of other plants. Its invasive behavior is enhanced by its tolerance for a wide range of soil conditions and climate, and its success in disturbed areas. 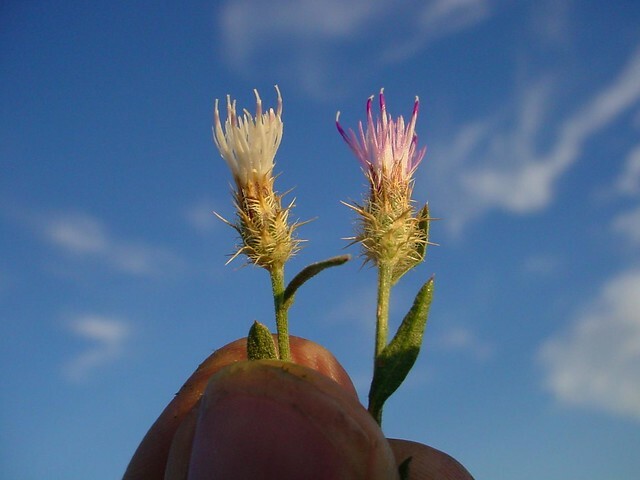 Small amounts of diffuse knapweed can be pulled by hand before the seed is set in summer. The sap may irritate the skin so wearing gloves is recommended.